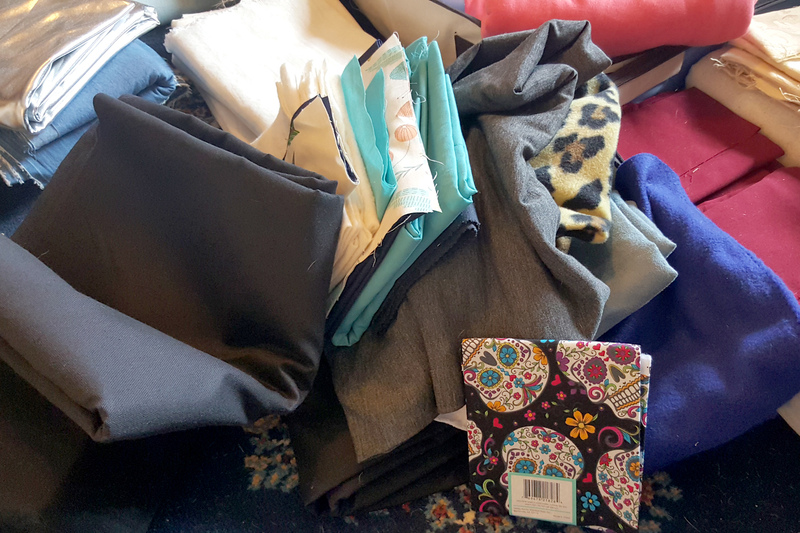 The great fabric sort begins! Now that I have set my goals for 2016, I thought it would be a good idea to start doing what I could to help myself be as successful as I want to be. By far, the biggest/hardest goal on my list was to organize and prioritize all my sewing projects. 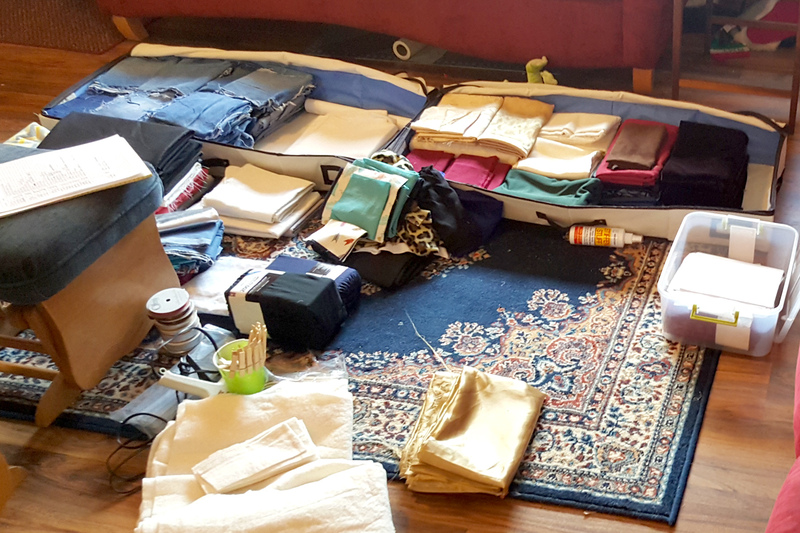 Part of what makes accomplishing this goal so daunting is that it has two huge components – sorting and cataloging my entire fabric stash, and then sorting, organizing, and prioritizing the projects I have planned. Denim scraps for the quilt I have planned. In the middle of getting my fabric organized, Todd ran across a screaming deal for some fabric on our local classified web site – he paid $75 for two large kitchen garbage bags full of yardage that included nearly 20 yards of exquisite lace! I went through the fabric and culled out anything I absolutely know we wont use, and then sorted the rest along with my existing stash. 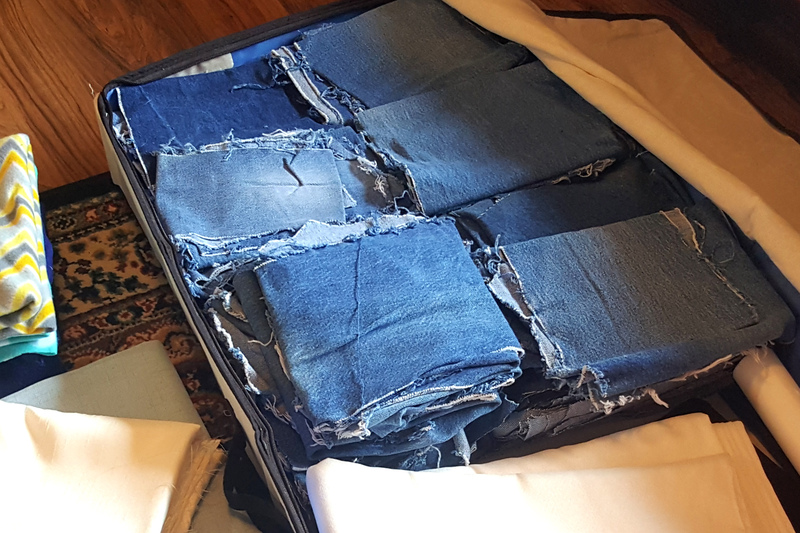 I keep my fabric in two flat canvas boxes that fit under our bed, and I have them separated – LARP projects in one and daily garments and quilting in the other. The result of the sorting is a beautiful catalog of fabric that details yardage, width, type, and a helpful description so I remember which one it is. The list is actually much longer than this, but you get the idea. Once I did that, I was able to put a note on yardage that was already committed to a specific project, and it also allowed me to start “assigning” fabric to projects I want to make. I made a similar table for projects, and I organized it by project. I do have two sort of “headings” for a couple groups of projects – the Try Something New Every Month list of projects, and I have costume projects specifically listed for LARP. Like the fabric table above, this isn’t the complete list either, but it gives a good example of how I’m keeping track of my projects. The Type column indicates new project, work in progress, or unfinished object, while the Project Name column is pretty obvious (to me, anyway) – it’s a good reminder for me what each project is. In the TSNEM, I decided that if a project fell specifically under one of the challenges I have set for myself for the Try Something New Every Month project, I would indicate which month it would work for. I then indicated whether or not I had the fabric on hand and the details about the fabric. The Status and Deadline columns are easy to explain – I estimate how complete each project is, and when I have to have the project finished. As you can see, I have LARP projects broken up into two deadlines – the first, May 20th, is just in time for our first event of the year, and August 20th is perfect for the second event. 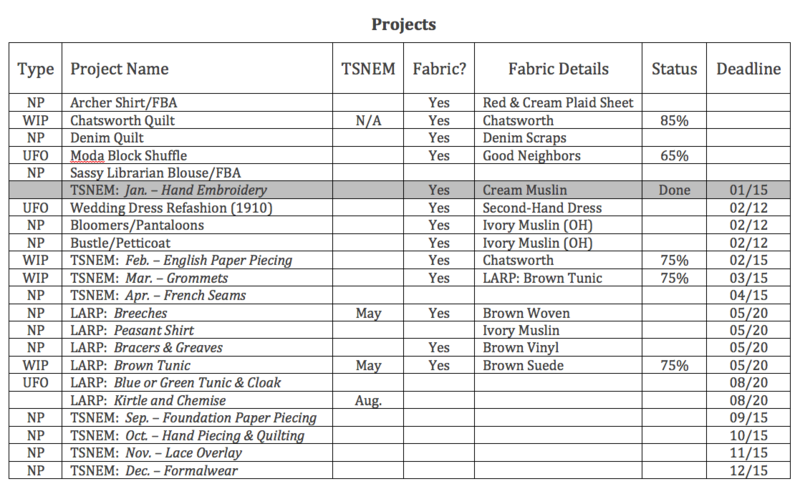 What is really nice is being able to look at the two lists and combine them where I need to – it also prevents me from buying fabric for a project when I don’t need to! I still have some work to do to determine some deadlines for the projects that don’t have any, and I need to decide where they fit best into my schedule as it is. When I finish a project, I gray out the row so I know I can skip over it. By keeping it listed and not deleting projects when they’re complete, I will have an accurate list of completed projects at the end of the year! The pile seems never ending. Doing this is forcing me to look at everything I have and give it a deadline. Working within a schedule is always better for me, and I seem to work more efficiently when I have a deadline. 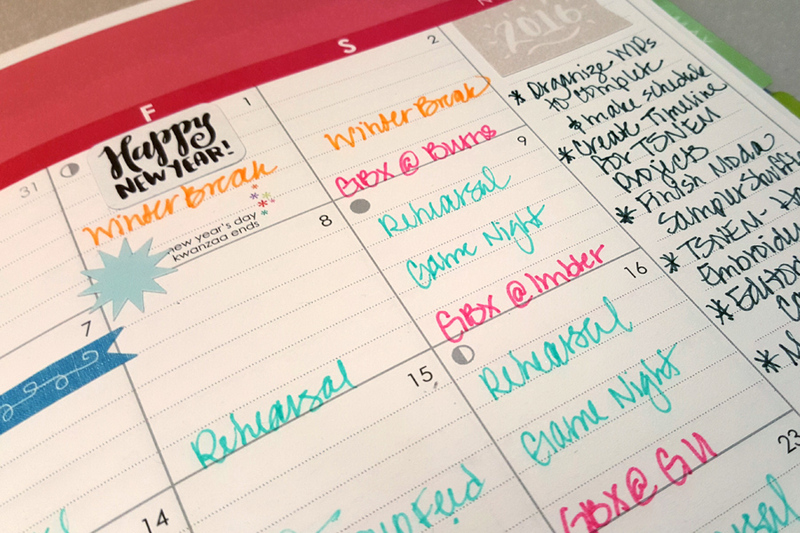 This is a win-win for me – not only do I have a prioritized list of projects with deadlines, I have a ready-made editorial calendar, and I have a schedule to drive me. In addition, if I stick to my plan, I will definitely meet my goal of posting at least once a week because I have been able to build the editorial calendar to reflect that goal. In addition to the editorial calendar, I have added the project deadlines to my daily planner that I carry around with me. I make specific goals for each project that I keep track of weekly and monthly. I know that by keeping the goals in front of me that way, I will be able to stick with them and get my projects finished! What do you do to organize your projects and fabric stash, and how do you stay on top of the status of each work in progress? Linking up at Flamingo Toes, Sew Can She, Crazy Mom Quilts and Stitch All the Things. I don’t track my fabric stash, but I do organize it by color which helps me pull what I want for any project. I’ve recently begun a project to organize my scraps and am making headway on that. I recently created a list of my WIPs and it’s quite a long one. Better get working on that! Yeah, my WIP list is HUGE – I know there is a big chance I won’t get through them all this year, but it’s nice to be able to prioritize them and try. I can also add to it as needed. I woke up this morning realizing I had forgotten to add two very important projects – my daughter’s garters for her wedding. They’re being made out of leftover fabric from my dress and parts of my mom’s dress. Your organization is so efficient. I bought The Quilter’s Planner and that has sections listed for the years’ projects. So far it’s working well to help keep me organized, projects prioritized, and materials needed. I haven’t cataloged my stash yet, as that seems to be a daunting task for me at the moment. I do have it wrapped on comic book boards and stored on a book shelf so at least I can see what I have. Maybe one day I will get to listing it out so I can make better use of what I have. I looked at the Quilter’s Planner, but I couldn’t see the inside well enough to be able to tell if it would work for regular sewing projects (apparel), as well. I bought comic book boards, but unfortunately, we just do not have a lot of storage space in our house so my stash is stored in flat fabric “boxes” under our bed. Some day, when the kids are grown, I will have a dedicated craft room, but for now it works. I am definitely not rushing them growing.